Amazon is full of 1 star reviews for the game. But what's the issue with the game? Rance IX also got a 10? I know Rance X got a 10 from them. In Rance X's case, it's also the highest rated VN ever on erogamescape (basically Japan's VNDB) so maybe Japan just love Rance? I appreciate what the series has accomplished but it's not for me. Still, giving Rance high score doesn't discredit the site. Guess I'm either waiting for impressions or a price drop. Thanks! Hello, Clannad for Switch is going to have the same english script as the PC's Seikai Project release? Just a guess but I'd assume so. The PS4 version seems to have used that translation and credits them in the ending credits, so it seems likely. Yeah my bad, meant 10. Other than Nightshade (JP), was there another english visual novel released for the Switch available as a physical title? Not sure I read somewhere that this is set before addiction, but it isn't related to addiction, just part of the series. and the trophies in english surfaced months ago, so maybe it's coming to all platforms? Vita will most likely be PSN. I doubt they were signeds on by Degica/Limited Run for physicals. Switch for sure though. Degica said they have one final Vita LRG release that they’d announce soon. I bet it’s this one. Interesting. Love SRPG and those old-school arts. It makes me tempted to dig out and finally play my copy of Daibanchou. Probably due to the influence of Sakura Wars, I love VNs with actual gameplay elements. Yeah, I loved how Alicesoft plays around with it. Every game has different mechanics to learn too, so it's all pretty neat. I stick with them and Eushully for that fix, although for traditional I am also partial to Navel because they started me off with Shuffle!. As for Rance IX, yeah it was Rance X that got the 10(and deservedly so). Rance IX I'd argue is good, but it's not great. My main issue is that the game spoils its own story segments because of the interface they use. You literally see an image of what's up next, whether or not it's a battle, and when you're going to get that ero scene. The menu looks pretty, but that hurts. I'm glad that it's the only time I've ever seen them do something like that. For Eushully, I also got Soukoku no Arterial in my closet. When I was studying Japanese, I occasionally bought VNs from mandarake to motivate myself. Managed to pass N2 last December, I developed a sizable VN backlog in the span of three years lol. Hopefully I will be able to play them asap and catch up on some old classics. Regarding Rance, I will probably start playing the series with Rance 01. I heard it is short but fun. I think I'll give the games a chance when MG is localizing most of the series so I can binge play in case I like them, Steiner seemed to be praising them a lot. Rance 01 is probably for the best, especially as it's canon. The original Rance 1 does have an english translation and is extremely short(maybe 30mins to 2 hours? memory and experience bias might be at play). Rance 1 is an interesting diversion if you have the time. Being an 80s era adventure game, it's pretty cryptic, and the length/difficulty is only there because of those weird mindgames. If it's too much for you, just play it with a guide, and you'd be done quick. I did pick up a ton of Alicesoft trading figures recently, but I don't see myself posting about them on Era due to lack of interest. I will say though, that I picked up my first game of the year being "Gakuen King"(学園KING －日出彦 学校をつくる－ ). I won't be playing it for some time though because apparently Mamatoto only allows you to do one girl's route per playthrough, and there's 9 girls. I'm going to have to beat the game at least 9 times. Yeah, I imagine the gameplay is what driving Rance to become a long-running series in this genre. For better or worse, I will experience it before judging if it is good. Very interesting! Just checked Alicesoft site, so apparently they have allowed a bunch of old games, including the one you mentioned, for free download. I saw some Rance and some names that I recognize (eg. Toushin Toshi). Going to check how to run these games on PC. Regarding posting on Era, yeah, I agree that sometimes we will never receive responses if we post something niche. I posted about Riddle Joker a few pages ago and there was no response. But I will say keep doing it. Sometimes people do notice and I certainly want to see a few Alicesoft figures. I can recognize some of the more popular characters of their titles even though I have never played those games (like your avatar, Masou Shizuka. She is very popular, as far as I know). That's where you'll be surprised, all of the Rance games play differently(I guess 01-03 are more similar, but they are remakes that changed everything). If you don't get into Rance, I'd at least highly recommend Toushin Toshi I&II from their freeware catalogue. They're more of a traditional RPG style, but the plot gets pretty interesting. If you do get into Rance, I might suggest you hold off on Kichikuou Rance which is a spinoff. It appeared at a time where they thought they'd go under so it does spoil some stuff that they actually had time to flesh out and make their own games. Still one of the best games from the series though, it'll be brutal on your first go. So I saw that the keys for Tokyo Chronos came in... A little confused since I requested 1 of each key (because I dunno why). PSVR is obvious, but what is the difference between a "Steam" and "Oculus" key? Steam supports Oculus and Vive, so is the Steam key for either-or, or just Vive? Does Oculus have a storefront or something? Oculus Rift has its own storefront and keys. Thanks for all the info. 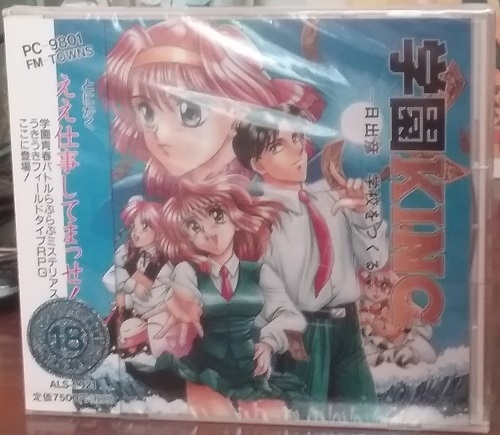 I will probably try Toushin Toshi first before getting to Rance 01 (need to find a copy first). What are your thoughts with the new premium pricing of visual novels on consoles? While the Vita was alive, games were 40USD for the Vita and 50USD at most for the PS4 as far as visual novels go, but since Steins;Gate Elite and every future game with a retail release, I feel like they're all 60USD. As I said I haven't played Rance yet, but by design alone I like Miracle Tou the most. I have no issues with it. As long as they keep coming and are quality (and have the option of physicals...) I'm on board. I don't diminish the value since it's just text-based or anything. I'm not going to lie, people are fickle. the chars in the top 10 tend to be stagnant, but swap out the top spots depending on who had more screentime in said game. Shizuka benefits from this because of her role in 2/02, 3/03, VI, IX, and X. She's also in IV, she's everywhere so it helps. Kenshin is super popular, afterall she has to be when she has a dozen figures when most have none. I wonder if Spike Chunsoft is releasing Yu-No anytime soon. AI: The Somnium Files is out in a few months, there are plenty of visual novels coming out until then and we have no release date for Yu-No other than 2019. I'm in. Wish we got the PSP port, though. Is Sachiko best played before or after playing Blood Drive? I still have yet to get around to playing it, so might do this one first. I assume, going chronologically with the release order, that it would make sense to play Sachiko first? Or does it even matter? If you can, play Sachiko's Birthday party before Blood Drive. Will do. Blood Drove is somewhere in storage right now anyways, so I might as well. I believe there's one, maybe two characters from Sachiko's Party that's later featured in Blood Drive. Spike Chunsoft has new games announced up until August 2019. Yu-No will end up being a very late 2019 release or even delayed until 2020. We should definitely give SHINRAI ~ Broken Beyond Despair some exposure. It's a small indie VN created by Gosatsu, a German developer of mystery VN's consisting of literally just two people (Gospel and Natsu). It's a Golden Age-styled whodunit with a lot of inspiration from Danganronpa, but with a more traditional setting (secluded, abandoned manor). The introduction and art-style don't really do the central mystery and story justice, which are wonderful. Definitely give it a look. Wagamama High Spec is on sale and I'm kinda eyeing it while playing the Ditzy Demons are in Love with me; I'm in a moege mood atm. edit: also probably getting that mermaid game on switch soon. Read a few impressions and saw some screenshots of Missing-X-Link ~Ten no Yurikago, Togi no Hana~'s demo on Twitter. I don't know the context of some dialogues posted, but they are nicely written and pretty reflective of the characters. The demo is 5-hour long so not sure will I play it, but very excited to read final impressions of the game when it launches late April. Nice. I like her design as well. Actually I own one Kenshin figure, which is a bootleg garage kit I got 6 years ago. Now I don't support these piracy products but it is still in my closet. Thanks for the impression. I just put the game into wishlist. Always support mystery VN. Our World Has Ended looks kind of interesting to me. Might give that one a shot when it comes out. Last VN I played was the first Dangan Ronpa, like, forever ago. Have you played Steins;Gate and Chaos;Child? I have not but I've heard good things about both, especially Steins;gate. You should give Steins;Gate a shot before playing something like Our World is Ended. Our World is Ended is basically Steins;gate but not as good. At least from the impressions I've seen.